NERD to launch the special edition of the magazine after Techkriti-14 Nerd would be launching a special edition of the magazine at Techkriti in March 14. The theme of the magazine is decided to be space technology for more details visit the webpage or this issue. 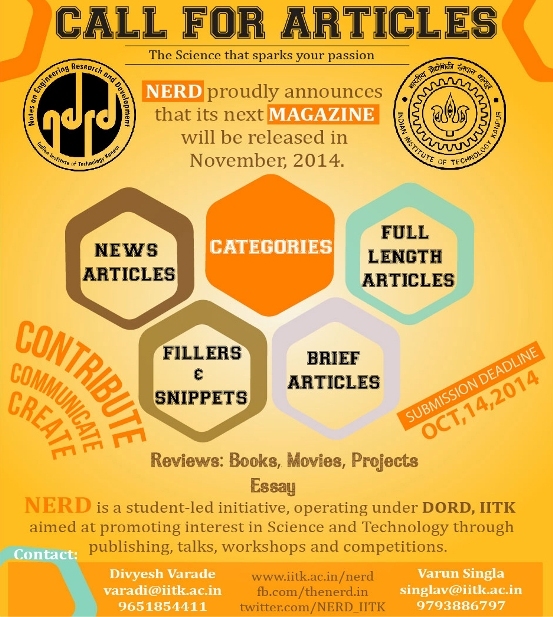 NERD Newsletter is to be launched in Jan -14. The NERD newsletter will be launched in late January 2014 as discussed by the team and other associates. NERD shall be publishing an 8 page newsletter highlighting the interview of “Prof. C. N. Rao” congratulating him on receiving the Bharat Ratna Award. © Copyright IITK. All rights reserved.